I recently noticed on Facebook that a New York Times article in a column called “The Hunt” has gained some traction, mainly in a negative light. The article is titled, “How to Get to Manhanttan? Save, Save, Save,” and it tells the story of a very young woman who was able to afford a nice apartment on the Upper East Side. The problem with the story is that the math just doesn’t add up. Annie, a financial services adviser and the subject of the piece, put down 35% on a $426,000 apartment. That’s $149,100. Plus, she spent $30,000 on renovations and remodeling. In total, she used $179,100 of her savings. From the article, it sounds like she worked for about two years and a quarter before making the bid on the apartment. That means she was putting away $6,633.33 a month, at bare minimum. Assuming she was putting away 100% of her take-home pay into savings, her average annual salary was a whopping $79,600. I personally worked in banking consulting until the beginning of this year, starting right out of college just like Annie, and I never made that much even before taxes. But further questions remain. She certainly couldn’t have saved 100% of her salary. Even though she lived at home she must have used some of her income on transportation (particularly to get to work, even if it is deductible), food, entertainment, clothing, other personal items, and leisure and entertainment. Did she pay for any benefits through her employer, such as health insurance, life insurance, long-term disability insurance, eye care, or dental care? Most likely. What about her 401(k)? Certainly someone as financial savvy as Annie would be putting away money for retirement at her young age and taking advantage of what we can assume was a match from her employer. And then of course there are taxes. Working in New York and living in New Jersey, Annie must have been hemorrhaging paychecks to the Man on those long nights stuck in the Lincoln tunnel. All in all, this article would lead you to believe that Annie was making six digits out of college. The last question that needs to be raised really doesn’t need to be asked at all. By now, it should be apparent that Annie received considerable financial help, most likely from her parents, in the purchase of this apartment. So one could assume that she doesn’t have any student debt because her wealthy benefactors most likely supported her through Binghamton University as well. And herein lays my major complaint with this story. The article lauds the virtues of saving and what it can get you in the (relatively) long run. However, the subject of the article is a daughter of wealthy circumstance. I concede that she likely saved a large ton of money, especially for someone of her age. But the fact remains that for the 99% a free education is not possible, and even someone with the discipline of Mother Theresa could never afford that apartment after working for less than three years without someone pitching in with a fat check. My true complaint is not with Annie though. She legally bought this apartment and she has every legal right to live in it and pursue satisfaction and happiness in her life however she pleases. The problem in this case is the NY Times. By failing to run the numbers and fact check this article they failed their readership. But through this failure they have reinforced the false ideal that hard work and discipline alone can help you achieve your materialistic goals. Rather, the NY Times should be espousing alternatives means by which young people and the middle-class can find safe, comfortable housing in New York City and other places around the world. What we need is innovation. Innovation in how we finance shelter. And innovation in how we actually shelter ourselves and how we conceive of adequate and satisfying shelter. This article reinforces materialistic societal norms and makes people believe that they are doing something wrong if they are not walking a taught tight rope towards their “American dream.” Didn’t we learn with the Triple-F Fiasco (Fannie-Freddie-Foreclosure!) that the American dream can easily turn into a nationwide nightmare? Renters can be happy people too. The NY Times doesn’t seem to realize this. With income inequality large and growing the NY Times and its readership need to realize that wealth and assets are not the only way to lead the good life. People can choose their own path. I suppose since this blog is called “The Economics Of …” and I titled this post The Economics of Manhattan I should talk about economics a bit. I hope that my readers do not think that economics is about making everyone rich or maximizing wealth for everyone. I am an economist because I want to maximize opportunity for everyone – their opportunity to be happy, whether it is through wealth and asset accumulation, or whether it being through less materialistic means. My hope is that societies will put policies in place so that the opportunity is available to everyone, not that society will define what happiness is and have everyone marching towards that goal through the engines of the economy. I should start by saying that this post is not really about economics so much as finance, but it should certainly interest anyone interested in public finance, the Detroit bankruptcy, the lunancy that sometimes encapsulates our financial system, and the Great Recession that the world is still recovering from. In 2005 Detroit had to make a $1.4 billion payment to its pension plan. There wasn’t any money to be found, so they floated bonds. Bank of America and UBS underwrote the offering, and Syncora Guarantee, as well as the Financial Guaranty Insurance Company (FGIC), insured the bonds, ostensibly protecting investors against losses. Ya know, just in case Detroit couldn’t pay. Detroit did not want to have to reach too deep to keep the labor peace, so the bonds were floating rate. Just in case rates went up, they bought interest rate swaps from their friends at Bank of America and UBS. If interest rates went up the banks would cover the additional payments to the investors, and in the event rates went down Detroit would have to pay the banks. And in the great legal morass that is Wall Street, the banks decided to spin one more web. They insured the interest rate swaps they entered into with Detroit. Ya know, just in case Detroit couldn’t pay. And the insurance companies were the same two that had already insured the bond payments to the investors. In 2005 this mutually entangling deal was heralded as so innovative that it was awarded the Deal of the Year Award by The Bond Buyer trade publication. But this deal, along with all the other toxic waste from the pre-Recession bonanza, just shifted risk around. It never eliminated it, or mitigated it. Municipalities around the country piled into the deals, and they are now suffering the consequences. By their nature, swaps are contrarian bets. One side thinks rates will go up, one side things rates will go down (if rates stay the same it is essentially a push). Both sides enter into the deal thinking they’ve got the sweet end of the bargain. 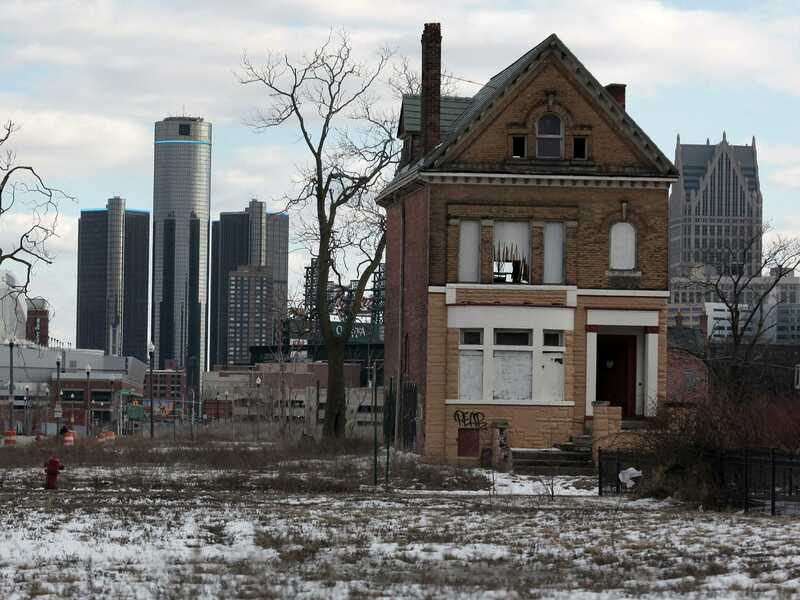 For the cities like Detroit, they figured interest rates were going to stay the same or go up. With this thinking, it was the perfect deal. They could essentially synthetically lock in a low rate by issuing the floating rate bonds and entering into the interest rate swaps. But on the other hand, banks would only enter into so many of these deals if the deal was sweet for them, AKA they figured interest rates were going to stay the same or go down. Municipalities throughout the United States must have all been drinking the same Kool-Aid that the banks were dishing out, because the banks did well in the deals and the counties and cities are all suffering. And I don’t find this hard to believe. Banks have sophisticated interest rate projection models. Plus they have already been found to have been manipulating interest rates (granted, for trading advantage, not to profit from clients, but it still points to their less than honest intentions). Because of this, municipalities around the US (Jefferson County, Alabama comes to mind) have been fighting the banks in courts on the grounds that the swaps were improperly peddled to them. Interest rate swaps were the first failure of basic human reason brought on by FBDS – Financial Bonanza Disillusionment Syndrome. The second was for the same two companies, Sycora and FGIC to take on all of the risk in the deal. Not only did the bond insurers guarantee the bonds, they also guaranteed the swap payments for the banks. And that seems beyond the limit of reasonable risk to me. It stands to reason that if Detroit was having trouble making bond payments it would also be having trouble making any required interest rate swap payments. Maybe the bond insurers were hoodwinked by the same bankers who sold the interest rate swaps to the city. The rest is history. Rates went down, so Detroit had to pay up to the banks. The just in case Detroit couldn’t pay turned into the largest Chapter 9 in US history. In the end, Detroit is dealing with a great big tangled mess, not the grand feat of social-financial engineering that was lauded in 2005. The investors, the bond insurers, the city, and the pension fund are now all fighting it out to get the biggest piece of the pie. I wonder if anyone sitting in that room right now is saying, “What were we thinking back then?” My hope by publishing this post is that the next time someone has an idea like this they will use common sense, economic principles, and sound risk management to steer clear of another fiasco like the one Detroit is facing right now.